Click the button below to purchase online! Crossing Borders is a dynamic concert programme that creates a dialogue among contemporary compositional voices from Canada and other countries. The inaugural tour took place in January and March 2015 in Halifax, Philadelphia, and Toronto. 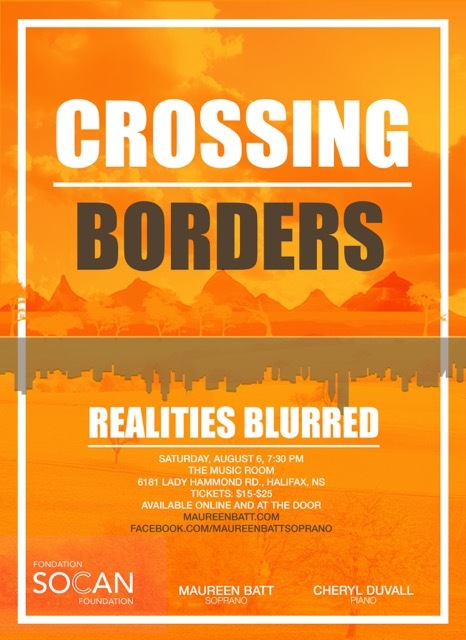 This year’s Crossing Borders: Realities Blurred series includes Philadelphia on March 13, Toronto on March 20, and Halifax on August 6, 2016. Using multimedia, cabaret style, musical theatre style, and classical music style, this concert features modern topics relevant to today’s society: mental health issues, HIV/AIDS, gender identity, body issues, and is infused with humour as it mocks nursery rhymes and even selfies! Each piece represents a reality that is blurred, a line that is crossed, a time that is both past and present. Maureen Batt, soprano: Noted by Opera Canada as a “young, lovely and captivating soprano,” Maureen Batt is an accomplished artist. Her career embraces the full variety of genres: opera, oratorio, cabaret, musical theatre, art song, and contemporary music. She has been engaged by the Windsor Symphony Orchestra, Opera in Concert, Toronto Operetta Theatre, Maritime Concert Opera, Toy Piano Composers, New Hamburg Live!, Open Ears Festival of Music and Sound, and Opera Nova Scotia. She is the co-artistic director of Essential Opera, who closed its sixth season this April in Toronto. In April 2014, Essential Opera presented a triple bill of Canadian premières where Maureen created the roles of Dorothy Parker (Etiquette, Pearce), Anna (Regina, Denburg), and Cindy (Heather: Cindy + Mindy =BFFs 4EVER, Thornborrow). Maureen has also created the roles of Sister Mary Francis (Time of Trouble, Raum), Helen (Aunt Helen, Pearce), Keri Ferrell (Hipster Grifter, Denburg), Lorelie Henderson (Stockholm Syndrome, Ryan), Bride (Cake, Pearce), Hannah (Hannah & Paige and the Zombie Pirates, Thornborrow). In 2017, Maureen will release her first commercial CD, with Jon-Paul Decosse, bass-baritone, and Simon Docking, piano, including Schubert’s Op. 52 and premièring Fiona Ryan’s Lady of the Lake. Cheryl Duvall is a multi-faceted musician and pianist. She is active as a soloist, collaborative pianist, teacher and adjudicator and has toured and performed throughout Canada, Italy, Latvia, Estonia, Finland, Switzerland, the Netherlands, England, Argentina and the U.S. She is especially passionate about contemporary music, which has led her to co-found the Thin Edge New Music Collective, now in their fourth season. Thin Edge completed a Canadian tour in winter 2013, were guest artists in residence at the SoundSCAPE Festival of New Music in Maccagno, Italy in 2013 and at Le Pantographe in Moutier, Switzerland in 2014. To date, they are responsible for commissioning and premièring 27 new works in the past three years, with plans for 13 new works throughout their fourth concert season. Ms. Duvall is the pianist for the Toronto-based Bell’Arte Singers and the internationally renowned Oakville Children’s Choir, with whom she has toured and competed internationally with gold standings. Besides performing, she maintains a full private piano studio and adjudicates piano competitions across Canada. Cheryl completed a BMus in Piano Performance and Theory, and a Diploma of Chamber Music from Wilfrid Laurier University, as well as a Master’s of Piano Performance and Pedagogy at the University of Toronto.